Baltimore City Council unanimously passed a bill on Monday that would force the city’s Wheelabrator trash incinerator to dramatically reduce its emissions of pollutants or shut down. 14 of 15 councilpeople voted yes; one, Councilman Kris Burnett (D-8), was absent. The bill, co-sponsored by 13 of 15 councilpeople, will now go to Mayor Pugh’s desk for final approval. “Mayor Pugh is 100% for clean air but she will need to review the legislation,” said a representative from her office. The incinerator burns most of the city’s trash, and also burns trash from surrounding localities. It is the largest single source of air pollution in Baltimore, and it is responsible for half of Baltimore’s industrial carbon emissions. Wheelabrator, the company who owns the facility, have said the incinerator couldn’t be modified to meet the bill’s requirements. Instead, they will have to construct a new facility. Last week, the bill passed a preliminary council vote 12-1. Councilmen Eric Costello (D-11) and Leon Pinkett (D-7) abstained from the vote, and Councilman Isaac “Yitzy” Schleifer (D-5) voted no. All three said they couldn’t support the bill because there was no fiscal analysis of how it would impact the city. “Until we have a plan and know what the financial impact would be, it’s irresponsible to rush and vote for this bill,” said Schleifer. Late last week, the city’s public works and budget departments released an analysis of that impact. The report assesses two possible plans for the trash currently sent to the incinerator. If the city sends it to the Quarantine Road Landfill instead, it would cost $98.6 million over seven years—roughly $14.1 million per year. If they build a new transfer station to ship the trash to landfills outside the city instead, that cost would be $73.6 million over six years, or roughly $12.3 million per year. But proponents of the bill say the analysis is flawed because it overstates the fiscal impact of the bill by assuming Wheelabrator would have to close the incinerator immediately instead of in 18-35 months, when the bill’s new standards would go into effect. Supporters also say the analysis assumes all trash that is currently incinerated would be sent to landfills, ignoring less costly options like recycling. It also doesn’t factor in the ways the city would save money by closing the incinerator. “In any scenario, moving beyond reliance on an aging incinerator saves the city money over time,” said Mike Ewall, Executive Director of the environmental group Energy Justice Network, in a statement. 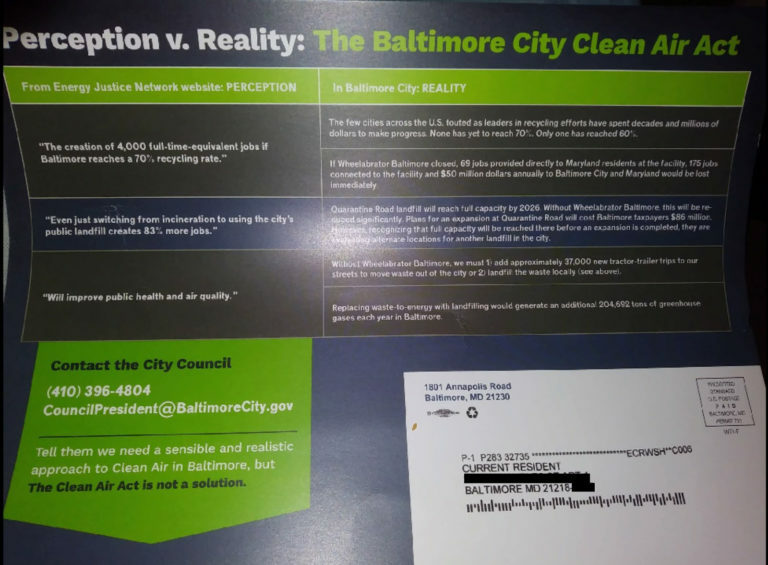 Wheelabrator has launched a campaign against the Clean Air Act in recent weeks, including a full-page ad in the Baltimore Sun, and robocalls and multiple direct mailers to residents asking them to encourage City Council to vote no on the bill. “Tell them The Clean Air Act is not a solution,” the mailers say. Some of them directly contest claims made on Energy Justice Network’s website. Wheelabrator’s mailers direct residents to a site they created, GetTheFactsBmore.com. Energy Justice Network created a webpage responding to each of the mailers’ claims. Dante Swinton, an organizer with Energy Justice Network, was thrilled that the bill passed despite Wheelabrator’s aggressive campaign. Councilman Ed Reisinger (D-10), the bill’s lead sponsor, hopes Mayor Pugh will sign the bill. He said her office’s only concern is that shuttering the Wheelabrator incinerator could leave the city’s landfill overwhelmed with too much trash. “She understands the health part, she understands all that,” he said. “She’s right to be concerned about the sustainability and the lifespan of the landfill, but I explained to her that all the city has to do is to stop accepting trash from other jurisdictions and out of state, and we’ll be able to sustain the landfill until they expand it. Swinton said with 14 yes votes, he’s feeling confident: “According to some council folk, it’s unlikely that she would even try to counter [the bill’s supporters],” he said. Now, Swinton says, proponents will work on ensuring that the city transitions to using more zero-waste strategies like recycling and composting. “I think the next steps are talking to the comptroller, talking to the mayor, about those ideas that we’ve been trying to push for the last few years, to make sure the replacements are just, that there are well paying jobs that are being developed out of this approach,” he said. For more on the Clean Air Act, check out our coverage from the bill’s previous two hearings. Correction: A previous version of this story incorrectly stated that Ewall said the city’s fiscal analysis did not factor in the costs of Wheelabrator’s tipping fees. Ewall was referring to state impact document; the city’s fiscal analysis does include this cost.